Start with this basic juice. Make sure half your glass is filled with apple juice to cover up the taste of the vegetables. Every day, add one leaf of kale to your mixture. Gradually add other healthy vegetables in season, including spinach, golden beets, Swiss chard, as well as experimenting with other fruits, such as cantaloupe, pears or watermelon. There are many fancy juicers on the market. The one I recommend – the Jack Lalanne Juicer – is inexpensive and from an old‐time fitness expert, the guy who swam the English Channel tugging a barge behind him. Many people complain they don’t have time to juice – you do! When clients complain about not having time to do the job, I simply take them up to my kitchen and whip up a delicious glass of juice in about 2 minutes. 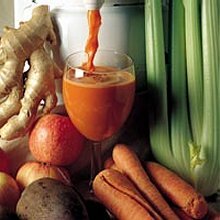 There are many recipes and many books about juicing, but the general thought is simple. Half your glass should taste good. The other half should be good for you. So, for example, half your glass could be fresh organic apple or pear or pineapple juice. The fruit juice will cover up the taste of the sharper vegetables like spinach or kale. My favorite juice is celery, apple and parsley. I always feel great when I juice, and those of you who are following our Total Fitness eating plans will note that when you juice for breakfast, you only need to add a protein and a healthy fat – your juice supplies your vegetables and healthy carbohydrates. One of my favorite breakfasts is organic turkey sausages and a glass of fresh celery, parsley and apple juice. When I eat this for breakfast, I am not hungry for a very long time and I have tons of energy!